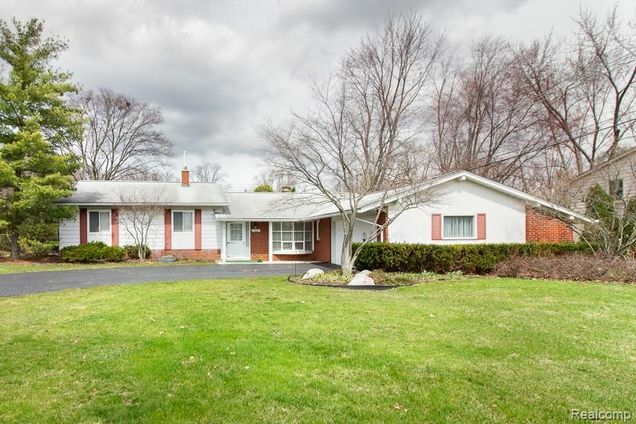 Available for the first time in over 50 years, this spacious brick ranch has been lovingly maintained by one owner! Rare 4 bedroom and 2.5 bath ranch with over 2000 sq ft has many nice features and amenities! Walk through the front door with hardwood flooring opening up into the breakfast nook and large kitchen with an abundance of cabinets; 1/2 bath right off kitchen and large first floor laundry area. Head into the family room with double sided gas fireplace, oversized door wall leading to fenced in backyard and brick paver patio. Off the family room there is a large formal living room with formal dining area & master bedroom with WIC and master bath and 3 add'l generously sized bedrooms with two full baths to complete the home. Updates include: brand new top of the line Navien boiler and on demand hot water system only 6 weeks old, updated windows throughout, freshly painted, recessed lighting, newer dishwasher and 2 car attached garage! Sellers offering one year home warranty! Hello, I’m interested in 5524 Pembury and would like to take a look around. The details on 5524 Pembury: This house located in West Bloomfield, MI 48322 is currently for sale for $249,900. 5524 Pembury is a 2,062 square foot house with 4 beds and 2.1 baths that has been on Estately for 1 days. 5524 Pembury is in the West Bloomfield neighborhood of West Bloomfield and has a WalkScore® of 36, making it car-dependent. This house is in the attendance area of Warner Upper Elementary School, Wood Creek Elementary School, Harrison High School, and O.E. Dunckel Middle School.